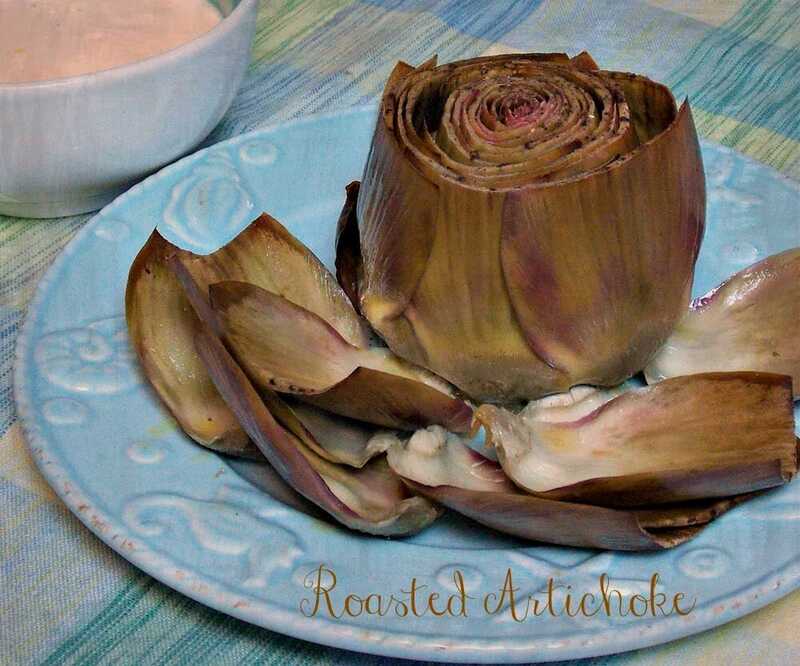 I never had a fresh cooked artichoke growing up. If we were served one, I’m sure it was one from a can. I’m not sure why we never had them. Maybe they just weren’t abundant in New York State back then or maybe my mom just didn’t have an interest in them. I normally don’t buy artichokes because Grumpy just is not a fan. But when Oakley from Frieda’s Specialty Produce emailed offering to send me some, I wasn’t going to say no! After all, I love them. I figured I would just eat them all by myself as a special treat! Needless to say, if I come across any as beautiful as these at our local grocery, I would be very inclined to buy one. Yes, that is a garlic clove popping up out of that beautiful artichoke. This is a Sangria Artichoke. I was fortunate enough to get one of these along with a Fiore-Viola Artichoke and baby artichokes from Frieda’s. I know I will be looking for these beauties next time I go shopping. I started out with just the baby artichokes. I knew it would be just me eating them so I figured the 4 tiny ones would be enough for me. Um, no. That was not the case. While these beautiful little babies were tasty, it was not enough. I needed more. When it came to cooking these, I really didn’t want to steam. Roasting is the way I prefer to go when cooking a vegetable. So, I did a quick search on how to roast artichokes and was brought right to Nicole’s blog, Pinch my Salt. Her instructions were so easy to follow that I will send you her way to find out how to roast them. I cut my artichokes and soaked them in a lemon/olive oil/water solution until I was ready to prep them further. I then placed a globe on a sheet of aluminum foil and stuffed with a couple garlic cloves, drizzled with a little more oil, and gave them some salt and pepper. I wrapped them up and popped them in the oven. I am so happy that Oakley sent me these to try…..even if Grumpy refuses to eat one. It was a definite treat for me! 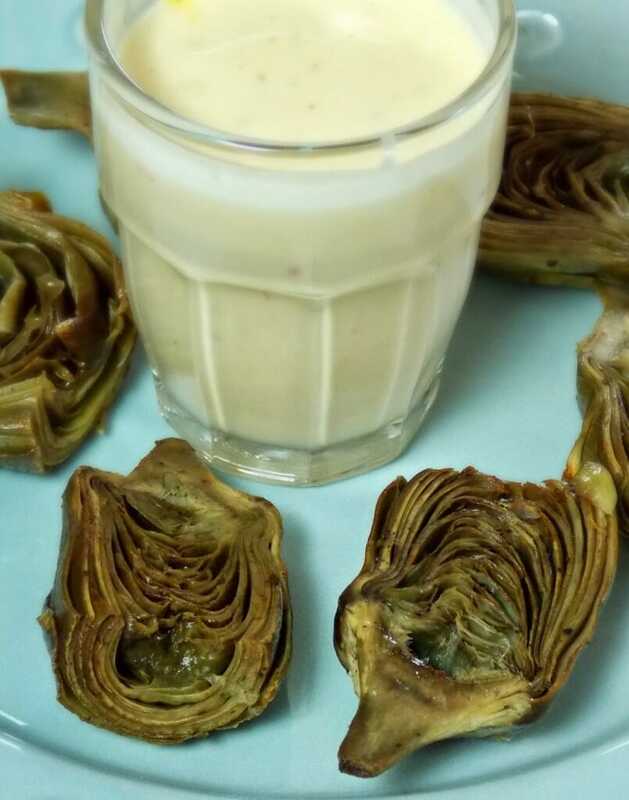 I enjoyed my Artichoke with a Garlic Saffron Aioli (recipe below). I received a package with baby artichokes and 1 each of the Fiore-Viola and Sangria Artichokes from Frieda’s Specialty Produce. I was not required to write a blog post in exchange for this product. I wrote this post because I enjoy Frieda’s Specialty Produce and want to share my experience with you, my readers. All views about this product are my own. Place saffron in hot water and let steep for at least 5 minutes. Mix mayonnaise, lemon, and garlic together. Add Saffron infused water. Serve with artichoke leaves for dipping. Prep Time: 06 hrs. 00 mins. Total time: 6 hrs. 0 mins. G'day! I LOVE artichokes YUM! I love love love artichokes. Thanks for sharing this recipe! Definitely will give this a go! Poor Grumpy – he is missing out!! I like to eat them, but must admit, have never made them. They look fabulous! 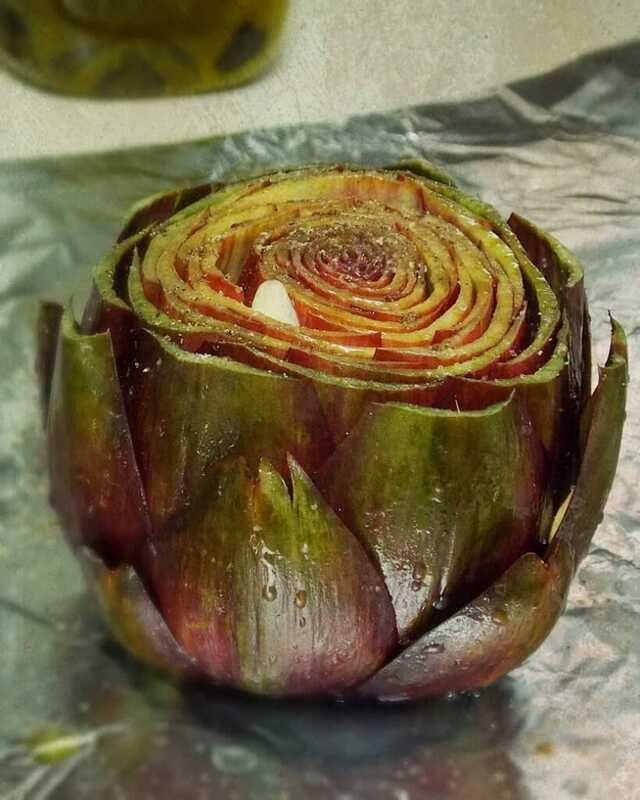 We LOVE grilling artichokes Shelby and your recipe looks fantastic! They look so pretty and sound so delicious! I have never cooked an artichoke before and imagined it was much more difficult! I am definitely going to give this recipe a go, as artichokes are just about to come into season here in the UK. Thanks!